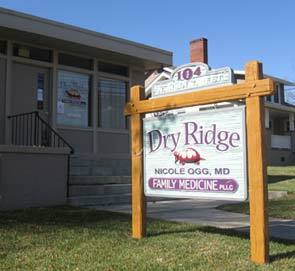 Welcome to Dry Ridge Family Medicine, founded in 2009 by local board-certified family medicine physician, Dr. Nicole Ogg. The goal at Dry Ridge Family Medicine is to provide excellent medical care and customer service to the individuals and families of Weaverville and the surrounding area. Dr. Ogg understands you have a choice in who your doctor is. She hopes to provide you with the best quality medical care and do so in a friendly, home-like environment. Dr. Ogg sees children and adults of all ages, both for sick and well visits. She does routine physical exams, sports exams, gynecological exams and DOT physicals by appointment. She is well trained in skin procedures such as mole removal and laceration repair. Chronic disease management is also a large part of her practice, and Dr. Ogg manages patients with conditions such as Diabetes, Hypertension, Arthritis, Asthma/COPD, Congestive Heart Failure, and Obesity. She also welcomes acute care visits for ailments such as sore throats, bronchitis, urinary tract infections, and back injuries. "Dry Ridge is the oldest known name, given by the Indians to an elevation that rises in the lower Reems Creek Valley extending northward, coming to its highest point on top of Hamburg Mountain." Why a turtle? The first reason is Dr. Ogg has always liked turtles and is an avid collector. The other reason is because the turtle shell represents a safe-haven and is symbolic for patience, stability, endurance and protection. She hopes that Dry Ridge Family Medicine will be a clinic people will feel comfortable and safe coming to visit.